The Swiss MYSTERIES magazine, print edition 3/2010, covers the story of nanothermite and a dispute between Harrit and german "debunker" Dr. Gunnar Ries. Ries made up a blog back in early 2010 and made a bunch of claims why the study wasn't that good at all- and Prof. Harrit responded to his claims. Ries did suggest to do his own testing on the chips, if he get some. MYSTERIES also asked swiss engineers who once claimed that WTC 7 was controlled demolition again on their standing. The magazine costs 7,50€ and is now available in germany and switzerland! Unfortunetaly there is no online version of the article yet, but they promised to deliver at least the interviews on their homepage soon! 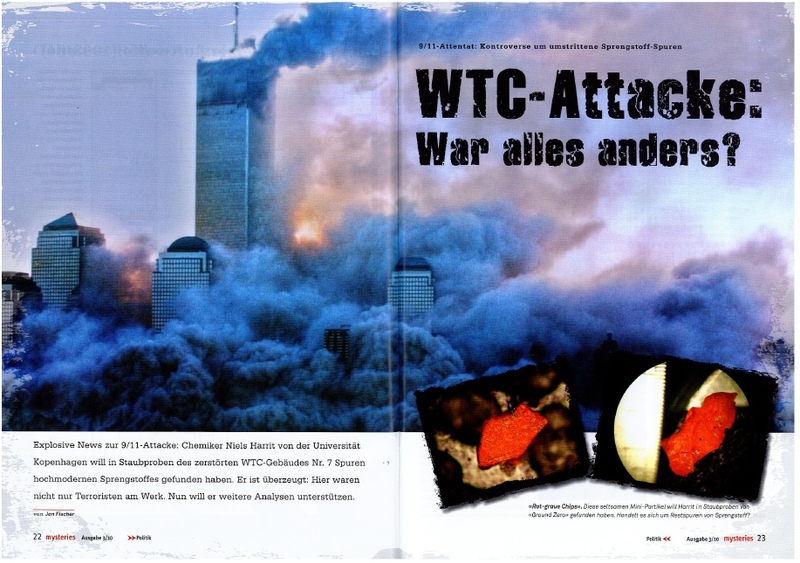 I will do a blog entry on my new blog at german 9/11-archiv.net next weekend!